A dog that digs out from a yard to explore a scent will tend to travel a short distance before it is found meandering and doubling back as it explores a scent. On the other hand, a dog that bolts in panic due to fireworks or thunder will take off at a blind run and can run for several miles. The circumstances surrounding your pet’s disappearance can be used to determine where to focus your search. Weather: A dog that escapes on a beautiful spring day may travel farther than one that escapes in a snowstorm. Extreme weather conditions (snow, hail, rain, sweltering heat) will decrease the distances that lost dogs travel. Terrain: A dog that escapes in a residential area will not travel as far as a dog that escapes in a mountainous area. Fences that create barriers will influence a dog’s travel since a dog will tend to take the “path of least resistance” when traveling. Cactus, heavy brush, and steep cliffs can be barriers that influence whether a dog continues on a path or changes directions. Appearance of the Dog: What a dog looks like can influence how quickly it will be picked up by a rescuer. In general, most people are less inclined to pull over and attempt to grab a loose Pit Bull they perceive as being “aggressive” than they would a “friendly” Labrador Retriever. Also, size matters as people are more inclined to pick up small dogs because they look vulnerable and are easier to transport and house than large dogs. In addition, people are more likely to attempt to rescue a purebred dog that they perceive to have value than a mixed breed dog. When average motorists see a mixed breed dog trotting down the sidewalk, their impression is often that the dog belongs in the neighborhood or that it is a homeless stray. But when those same people see a Boston Terrier, they are inclined to believe that, because it is a “valuable purebred dog,” it must be a lost pet. Population Density: A dog that escapes in Manhattan will travel a shorter distance than will a dog that escapes in the Rockies or in rural farmland. When dogs escape into areas with a high number of people, their chances of being found close to the escape point are increased. But in areas with an extremely low number of people, dogs tend to travel farther and their chances of being found close to the escape point are decreased. A dog that escapes in the middle of the night will travel farther before being seen than a dog that escapes during rush hour traffic. In addition, the level of human animal bond (HAB) will influence the recovery efforts. People with a strong HAB will go to extremes to find their lost dog. They will accomplish the “impossible” task of visiting all shelters, posting flyers, and contacting rescue groups while maintaining a full-time job and other family commitments. On the other hand, people with a weak HAB will quickly become discouraged, assume they will never see their dog again, and will stop searching. People who find stray dogs often misinterpret the dog’s behavior; they assume that the cowering, fearful dog was “abused” when in fact the dog has a xenophobic temperament and has been shy and fearful since it was a puppy, due to genetics and puppyhood experiences. Dogs found in rural areas are often assumed to be “dumped” and homeless; many rescuers never think this could be a dog that was lost. Some people who find a stray dog that does not have a collar automatically assume it is “homeless” and therefore they immediately work to place the dog rather than attempt to find the dog’s owner. In addition, the first place the owner of a lost dog will search for his or her dog – the local shelter – is typically the last place that someone who finds a loose dog will take it (due to the fear of euthanasia)! 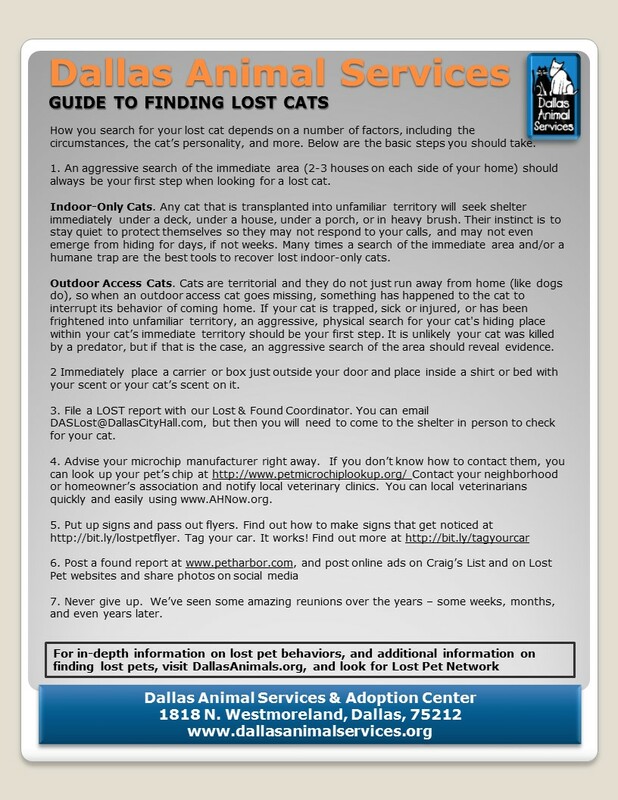 Be sure to routinely check with your local animal shelter and also with any local rescue groups in your area. Sometimes lost dogs end up being placed in dog rescue groups who end up placing them in temporary foster homes until they can be adopted out to a new family. 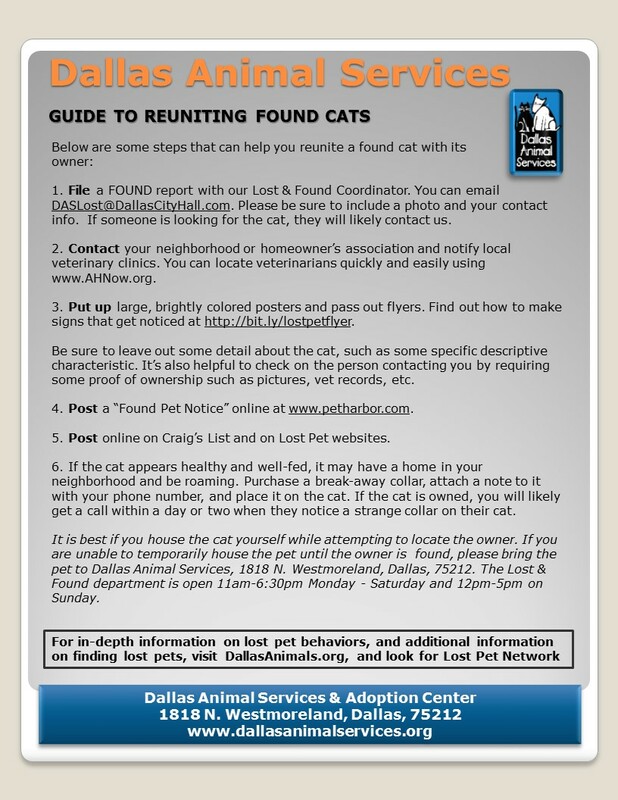 Your local shelter should have a listing of the organized groups in your area. In addition, many large pet stores hold weekend pet adoption events where “homeless, stray” dogs are adopted out to new families. It is possible that your dog could end up at one of these events. 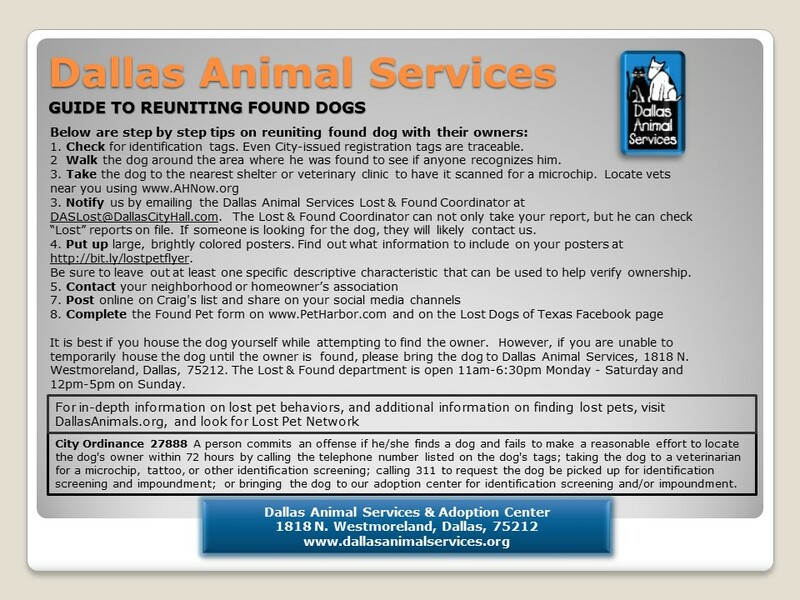 Find out when and where these adoptions take place and hand deliver a flyer of your lost dog to the staff. 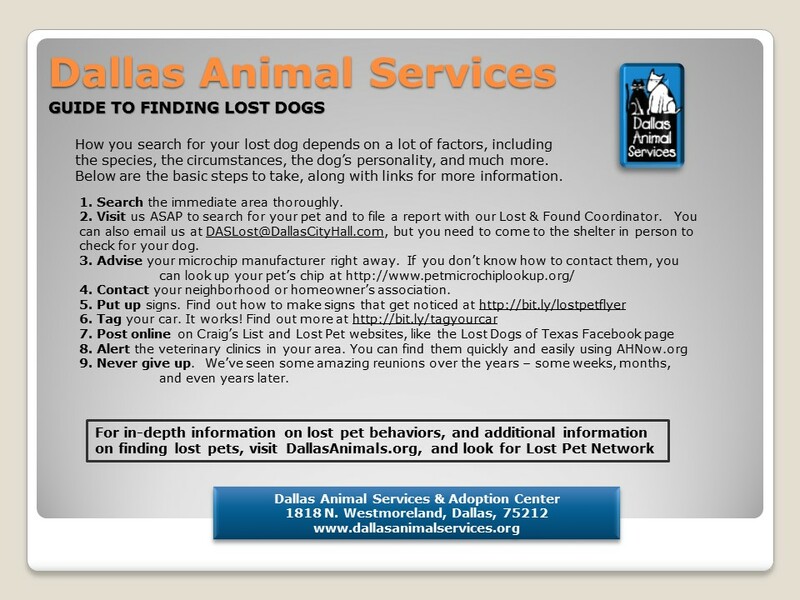 Finally, many rescue groups that end up taking care of “homeless, stray” dogs will post these dogs on www.petfinder.com. Be sure to check this website often in case your dog is ultimately listed there as an adoptable dog who is looking for a new home. One Last Thing: Do Not Give Up Hope! Physically, your pet is out there somewhere and you stand a good chance of bringing him/her back home if you remain focused, positive, and persistent in your efforts. Although family, friends, or coworkers might be unsupportive, YOU ARE NOT ALONE! Reach out and use the resources that are available to you through this website. The moment that you stop searching for your lost pet is the moment that your chances of a happy reunion plummet. Your biggest enemies will be discouragement and a lack of hope!